Chanteur Country Australien né le 15 Avril 1964 à Corryong (Victoria). 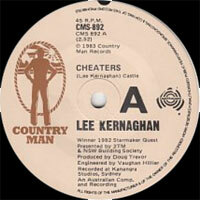 In Australian country music, Lee Kernaghan was as dominant in the '90s as Garth Brooks in America. He's also famous for the cowboy hat he wears. But there the similarity ends. Australian country music has held onto its romance with the land, small towns, and farm folk, and although Kernaghan, in his 30s, is the spearhead of the new generation of Australian country, he and his contemporaries hold fast to those traditional lyrical values, kneeling at the altar of those who came before them and carved a very individual path for Australian country music. Lee Kernaghan was born in April 1964 to Pam and Ray Kernaghan, one of the pioneers of Australian country, with 14 gold albums to his credit. It was within the family tradition that Lee and his siblings, brother Greg and sisters Tania and Fiona, served their apprenticeship. All have careers of their own but it's Lee who emerged as the star, by far Australia's biggest selling country artist. 1986 saw Lee traveling with his father Ray to Nashville where they performed together during the famous Fan Fare week. 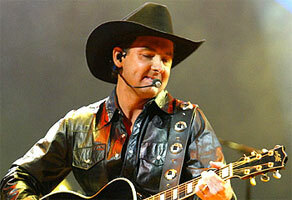 That same year, Lee Kernaghan was introduced to music producer Garth Porter. In 1991, Kernaghan and Porter started their songwriting and artist/producer relationship. The result was the highly popular May 1992 album The Outback Club, which quickly went gold and has gone on to platinum status. Since then, there has been no stopping Lee Kernaghan's popularity. In 1993, his second album, Three Chain Road, was given its first public airing at the renowned country music festival The Gympie Muster, with almost 60,000 country music lovers turning out. Thousands of Lee's fans waited for up to five hours in rainy conditions to shake his hand and to get an autograph. That second album saw Lee tip his now familiar hat to Australia's country traditions by recording with the "father" of Australian country, Slim Dusty. Kernaghan's songs echo Australia's yesterdays while offering an optimistic, romantic version of rural Australia today. It's a successful formula which Lee Kernaghan has carried through with his subsequent albums: 1959, Hat Town, and 2000's Rules for fhe Road; where Kernaghan covers classic Australian country and guests with legendary Australian country performers, his new songs fitting the rest like a glove. 1983 SP Country Man CMS 892 (AUS) . 1985 SP ? (AUS) .